I’m sure we’ve all heard the saying “What happens in Vegas, stays in Vegas”, although with social media and our constant need to post what we’re doing what happens in Vegas may end up going viral on Facebook, Twitter or Instagram. 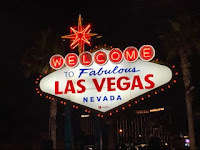 If you’ve never been, Vegas is a great city and don’t believe that you need to gamble. I’m “lucky” enough to go a few times a year for conferences and can’t tell you the last time I gambled. Well gambled, with my money. Gambling with my health is a whole other thing. There are people EVERYWHERE. Where there are people there are germs and with the number of people you can be assured that every surface that a hand can touch has been touched more times then I care to think about in between cleanings. I can also say with absolute certainty, hand hygiene after using the washroom was sketchy at best based on my observations each time I used a public restroom. If you don’t pick anything up while at Vegas there is always the chance of picking something up on the flight home. As I’ve blogged about in the past, it’s pretty well documented that planes are not the cleanest of areas and that infectious bugs can readily be found on tray tables, head rests, arm rests etc. What we have not talked about is what may happen if someone in your vicinity begins vomiting. I thankfully was able to upgrade on my red eye back from Vegas on Tuesday night. My colleague was not so lucky. She had the bad luck and was sitting behind someone who began vomiting. The passenger was eventually moved to the back of the plane, but not until they had vomited several times. The question I have is, will my colleague come down with whatever caused this passenger to vomit? Considering we were in Vegas, any one of the above could be plausible… This passenger happened to be a male so I think it’s safe to say we can take “early stages of pregnancy” off the list. This passenger also happened to be traveling with a group of friends. The likely answer is that he had been drinking too much alcohol, but if he had Norovirus we should know by Friday based on the average incubation time! Fingers crossed my colleague doesn’t spend her weekend throwing up! While it’s hard to protect yourself from airborne diseases like measles, we can protect ourselves from most other infectious agents including norovirus (unless of course you’re accidentally getting tiny particles of poop or vomit from an infected person in your mouth) by disinfecting the area you’re going to call home for the next several hours. If you don’t travel with disinfecting wipes, I would consider doing so and would highly recommend you wipe down your head rest, arm rests and tray table! You never know who was sitting in your seat the flight prior and with the importance of turning around the cabin and getting the next flight off I can guarantee the level of cleaning is limited and not likely to remove the germs the last person left behind! PS – I’ll tell you next week if my colleague got sick! I find, when it comes to Valentine’s Day, it is hit or miss in terms of how or if people celebrate. My husband and I exchange cards and candy. This year I got candy. My husband only got a card. I have a colleague who decided that since he never got anything for Valentine’s Day he was going to stop “celebrating”. If truth is known, my favorite day of the year to celebrate is my birthday. It’s MY day. I get to pick what we have for dinner, dessert and what we do. Those that know me may think that’s everyday and that may be slightly true, but on my birthday I milk it for all it’s worth! This year, while we exchanged cards and candy it was pretty low key. We’ve had influenza hit our house and my husband has had his first ever bout of pneumonia. 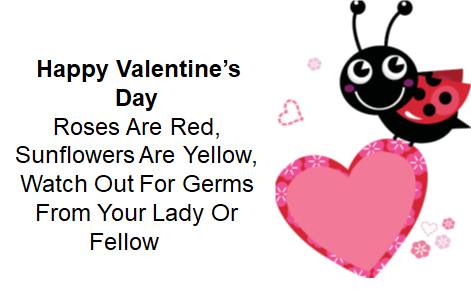 Our infection control measures have obviously been lacking and yes, if you’re wondering neither of us had our flu shot… Since Valentine’s Day for many is a day of love, kisses and snuggles, sharing our germs is not really the ideal gift. Kissing is probably one of the most common signs of love and affection, but did you know that our mouths are home to thousands of different microorganisms? While kissing can be a direct route of transmission for oral related diseases, in-direct transmission through contaminated hands and surfaces leaves us susceptible to catching someone else's "cooties". Wishing everyone a Happy Valentine’s Day! If, like me you love chocolate and decide to hit the stores to participate in post-Valentine’s Day Chocolate sales, I really love Cadbury’s Mini-Eggs!